DFWTT is involved in a lot of community efforts. To read more and to keep up-to-date of our activities, please visit our News & Information section of our website. In our efforts of promoting table tennis in the metroplex DFWTT conducts exhibitions and clinics at school, shopping malls, churches and pretty much any open places. Please see our News & Information section and archives for details on where DFWTT has done exhibitions in the past. Please contact us for further details on how DFWTT can do a clinic or exhibition at your school or church. From time to time the media has shown interest in what DFWTT does for the table tennis community in the metroplex. Please click on the links below for complete stories. 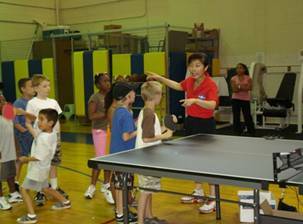 With our commitment to promote the sport of table tennis in the Dallas-Fort Worth area some of our activities are on a volunteer basis. Sometimes these activities don't go unnoticed - we have done many exhibitions and free clinics in schools, shopping malls and other places. In 2005 USATT and USOC recognized and awarded our Daniel Rutenberg as the Volunteer Coach of the Year. In addition, most of our activities are run with the help of volunteers! If you want to help or want to volunteer for future activities, please contact us. We couldn't do it without volunteers! Thank you! Coach/Founder of DFWTT, Donna Chen and Coach, Scott Ryan visited the NAS JRB (Naval Air Station Joint Reserve Base) Library on Friday, July 18th. The children in the NAS JRB summer reading program, Get In The Game, READ! were treated to a demonstration of Table Tennis plus hands on instruction about how to play the game. 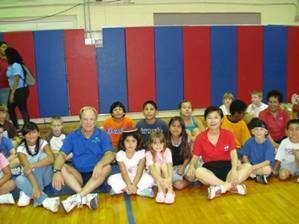 Over thirty children benefited from Donna and Scott's expertise and knowledge. A great time was had by all and the Base Library appreciates Donna's and Scott's time and talents to support the youth program.